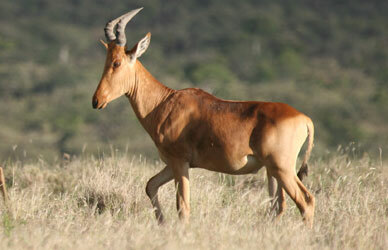 Amongst the category of antelopes, Hartebeests are considered the fastest runners. One can spot them in the eastern, southern and the western regions of Africa. These mammals are quite unique in features that helps them in being spotted very easily. These existence of these species dates back to the days of the Egyptian period. Infact they were used by various means in almost all kinds of rituals. The sub species of these species are considered in the endangered category. 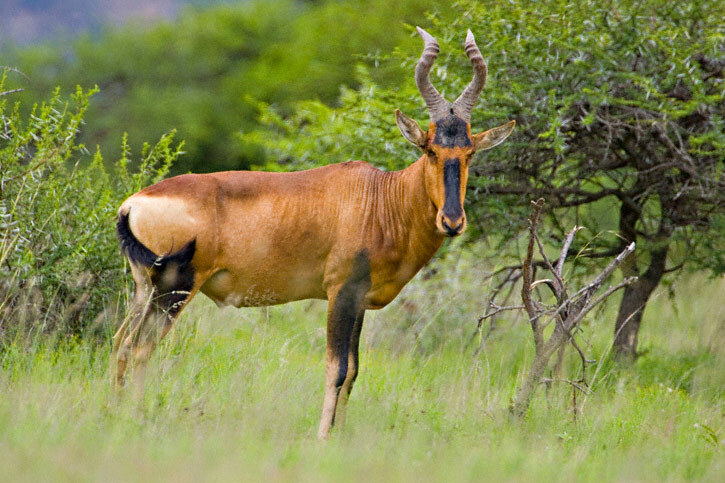 The name of Hartebeest is a derivative of the Afrikaans. In Dutch, the specie is considered a lookalike of the deer. One can spot these species in the Eastern, Southern and Western regions in Africa. Size of Hartebeest: The length of these species is about 1.5 m.
Weight of Hartebeest: The weight of these species varies from 120-200 kgs. 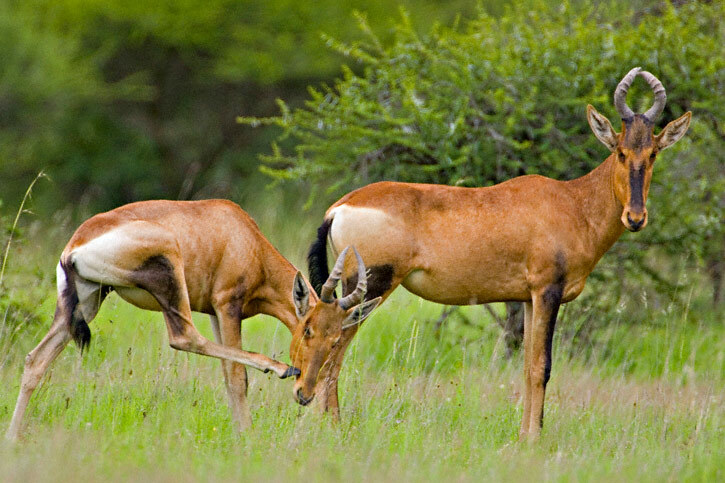 Color of Hartebeest: The color of the body varies from golden brown to red, tan and black. 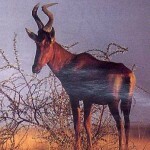 Legs of Hartebeest: The legs of these species are long and thin. 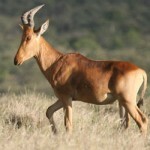 Face of Hartebeest: These species have a narrow and long, somewhat odd looking face. Ears of Hartebeest: Their ears are sharp and unique. 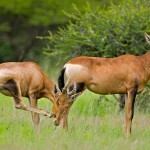 Tails of Hartebeest: These species have either brown or black hair. 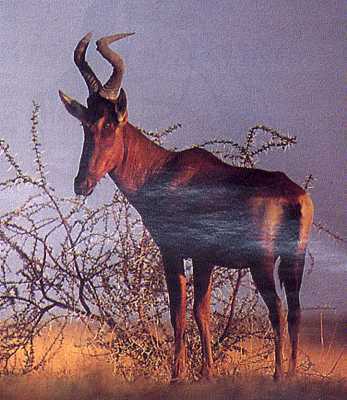 Horns of Hartebeest: The horns of these species are close to one another. The horns have a peculiar shape. The curves of the horns are pointed outwards as well as backwards simultaneously. The size of it is 70 cm in length. These species like to have only grasses in their diet. One could also observe that these species can survive long periods without having water. Anyhow, if the water is available regularly they would always prefer to have it. These species are largely found in the regions having medium and tall grasslands, woodlands, dry scrubs, bush etc. 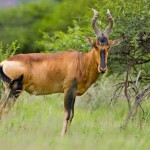 In fact these species can survive woods and high grass unlike other antelopes. They have a very inactive nature that makes them prone to being hunted and captured easily. The dry conditions cause the animals to stroll long distance in clans for grazing and water. The females stroll in clans comprising of 5 to 12 animals. These species prefer to have grass during the daytime. Water forms the most essential part of their diet. These species are isolated in nature and so they spread out in wide areas. The males really get adamant during the periods of mating. In fact the fights that break out during such times are worth a sight. In many cases, it might cause serious injuries. It is seen that the attitude of the females during the process reproduction is also quite different. They give birth in an isolated location on the scrublands. Usually the females do not like to give birth in clans or in open areas. Even the younger one stays alone in an area for many fortnights. The males usually go away from their mother at the age of 4. After 7-8 months of pregnancy, the females give birth to the younger ones. They usually prefer isolated areas for reproduction. The mother nurses and cares for the calves for about 4 years. However, the girls usually stay with their mothers for the entire life. In case of these species, the males are usually with the mother for 2-3 years. The life span of the mammal is 11to 20 years on an average.